. : Optics & Photonics Focus :: Towards Filming Chemical Reactions :. Scientists can twist light to create tiny typhoons on metal surfaces. Particles close to the light swirls can get trapped and pulled to the center of the whirlpool, like an autumn leaf is pulled to the center of a pond whirlpool. Molecular dynamics happens on extremely short time-scales and is very difficult to observe. Now, Pascal Salières from the Service des Photons, Atomes et Molécules of the French Centre à l'Energie Atomique (CEA-SPAM) and his international collaborators have used ultra-short laser pulses to study expulsion and recombination of electrons in molecules. Hereby, they were able to extract information on position and symmetry of orbitals. 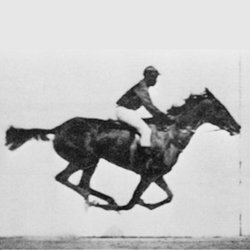 In 1887, Eadweard Muybridge published pictures from a high-speed camera setup in order to answer the question whether a galloping race horse lifts all feet off the ground at any time. In these early days of high-speed studies, a few pictures per second were sufficient to investigate interesting phenomena. Today, after over a century of development, we are beginning to study the fastest known processes in nature, such as the motion of electrons inside atoms and molecules. The study of electron orbitals in atoms and molecules is extremely difficult because of their size and speed. Direct photographic imaging using a stroboscopic lamp, for example, is useless. However, "as molecules are composed of charged particles, they can be driven by electro-magnetic fields," Salières explains, "and light is a rapidly oscillating electro-magnetic field." His team has used a soft X-ray laser in order to accelerate an electron away from a molecule and then to have it re-collide again. Upon re-collision, they measured extremely short bursts of light that might be employed as a stroboscopic light source for measuring ultra-fast phenomena. "These bursts only last a few hundred attoseconds," he points out, "that is a few hundred billionths of a billionth of a second." In Salières' experiment, a number of aligned CO2 molecules were simultaneously led to go through the process of losing one electron and then receiving it back again, resulting in the emission of an attosecond light pulse. "By studying this light pulse we study the dynamics of the charge. Our charge," Salières continues, "is an electron bound in a molecule that we strongly steer with the light field of the laser. Because we are using a laser, the dynamics of the electrons in all the different molecules in our gas jet are perfectly synchronized. Therefore, although we are not only observing one molecule, but a very large number of them, we do not see a wild chaos of wiggling electrons, but rather an amplified image of what goes on around a single molecule." The reason for this absence of noise is that the molecules interact with the laser all at the same time and in the same way. Technically speaking, their emitted light interferes coherently. "The original idea of coherent control", he remarks "is to make molecules do something (shake, bend, break) by manipulating them with some tool. Processes in molecules are very fast, so the tool needs to be very fast as well. With light pulses oscillating in a very well controlled way, one can thus drive very specific excitation channels in molecules, control their coherent interference, and finally control the whole process." One application of this process is tomography of molecular orbitals . "Indeed, when the freed electron re-collides with its parent molecule, it probes the structure of the molecule along the re-colliding direction that is given by the laser polarization. It encodes this information in the emitted light. By changing the angle of the molecules relative to the laser field, we probe the molecule in different directions and may extract this structural information from our measurements of the emitted light." Whenever pushing the envelope of what is known, experiments are both relying on and challenging theoretical descriptions. "The processes we study are among the fastest ever observed, and thus there has not been much data yet to compare to theoretical predictions," Salières observes. Nonetheless, he says that the principle features of their experimental data is reproduced by their simple models, and hence well understood. Concerning other aspects of their results, however, he notes that these results are "far ahead of the current capacity of accurate theoretical modeling and should trigger the development of new models." David Villeneuve from the Canadian National Research Council (NRC) in Ottawa, who initially proposed tomography of atomic and molecular orbitals agrees: "From a fundamental science perspective, it is very interesting to learn more about electrons in molecules. We can then play with wave-functions of electrons, for example, hereby gaining unprecedented control over these particles. In some way, we are approaching and entering questions of chemistry with methods that come from physics and it is highly interesting to see all these new developments. These experiments are still very difficult and there are only a few labs who are able to do them. In the end, however, all that matters is that the more control we gain, the more questions we can ask. This leads to new models, new understanding and eventually even to new technologies." Attosecond physics constitutes a tool to study and manipulate ultra-fast processes in nature. "Within the next 5 years," Salières says, "we expect it will become possible to shoot a video of a changing orbital during a chemical reaction, first in a proof-of-principle experiment, then in a more general case. In parallel, attosecond light pulses might be shaped or tailored on demand, opening the possibility of driving and localizing electrons inside the molecules. In the long term, these two advances may lead to a real-time control of chemical reactions." J. Itatani et al., Tomographic imaging of molecular orbitals, Nature 432, 867-871 (2004). AN is currently working on his PhD on disordered ultracold quantum systems at The Institute of Photonic Sciences (ICFO) in Barcelona (Spain). W. Boutu, S. Haessler, H. Merdji, P. Breger, G. Waters, M. Stankiewicz, L. J. Frasinski, R. Taieb, J. Caillat, A. Maquet, P. Monchicourt, B. Carre, and P. Salierès, Coherent control of attosecond emission from aligned molecules, Nature Physics (2008) 4, 545-549 (link). Famous sequence of a race horse that Eadweard Muybridge published in 1887 to prove that a horse lifts all its feet off the ground while galloping.